Guillotine , Paul Peterson, Wizards of the Coast, 1998. Like Family Business , the game Guillotine is an excellent beer and pretzels type card game that is easy to learn, plays in less than 30 minutes, and provides a whole lot of laughs. The strategies are simple, but this is an excellent lighter game for 2 to 5 players. The game is set in Revolutionary France during the time of the executions. Each player scores points by executing infamous nobles such as King Louis and Marie Antoinette (worth 5 points each) and avoiding the crowd favorites such as "The Hero of the People" (worth negative 3 points). At the end of three rounds, the player with the highest point total wins. Those are the rules in a nutshell. Exceptions to the rules and other twists are printed on the noble and action cards themselves. There is no need to create a rules cheatsheet. It is a very easy game to learn in 5 minutes. The game is similar in many respects to Mayfair's Family Business . There is a common line of people waiting to be executed. Most of the fun comes from rearranging the list, killing off the big ticket nobles, and avoiding the well liked nobles. 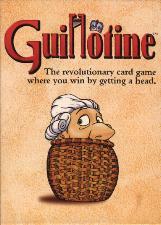 Unlike Family Business there is little attack and retribution between players: most of Guillotine can be played by maximizing your own score. The play and strategy of is simpler than many other games and has a few flaws and unbalanced cards (as Stephan O'Sullivan points out in his review, but I don't excessively berate the game for this. After all this is a simple game of the beer-and-pretzels variety. One area in which Guillotine shines is the production values and the quality of the artwork. Graphic design is by Christopher Rush and illustrations are by Quinton Hoover and Mike Raabe. The characters are very similar to the Disney artwork in The Hunchback of Notre Dame . Examples of the artwork are located at Trevor Clarke's site from which I've already stolen one image file above. The action card rules are explained both in text and little pictures which aid quick recognition. As mentioned before, all rules explanations are located on the cards themselves, so there is no need to carry crib sheets. The quality of the card stock is high, akin to a deck of Bicycle Playing cards from the United States Playing Card Company, but not as high as the embossed and flexible cards in say Elfenland by Amigo Games. The final production touch that I love is the cardboard spacer, which acts to hold the cards in place in the box, has fold out legs and a nice cartoon picture of a guillotine and executioner. This little guillotine is meant to be set near the head of the line of nobles - excellent job! In summary, I recommend this inexpensive card game to anyone who likes a simple, fast, easy game. In fact, the rating system on the box recommends play for ages 12 and up, I would go so far as to recommend it for ages 8 and up, or even for bleary-eyed gamers who need one more laugh to call it a night. [an error occurred while processing this directive] Last modified: Thursday, 09-Jun-2011 12:36:48 MST.